Bij het uitzoeken van mijn video’s kwam ik deze tegen (in HD bij Vimeo). Golden Gate Bridge from Alper Çugun on Vimeo. Ik mis het toch wel. So I get bored on a Friday night and I want a decent way to watch music videos. Rather than look for a service which provides this, I decided to revive our own toy of a couple years ago, so it’s alive (again! ): LastTV. More explanation here. And I guess this blatantly labels me as a programmer, no? 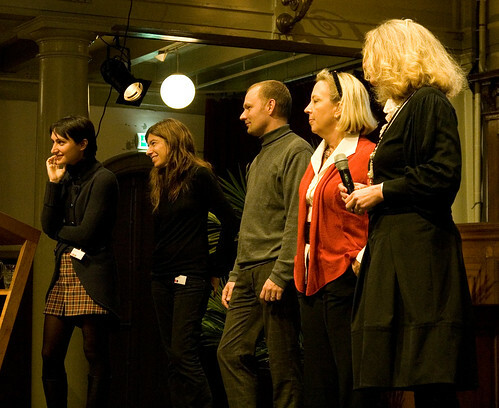 Last Tuesday I attended the Service Design Network’s conference in the Rode Hoed in Amsterdam. I’ve been interested in Service Design for a while but I didn’t really know what it was all about. This conference was the ideal way to learn more about this field. My findings are online in the report (Dutch only, sorry!) I’ve written of the conference for Frankwatching. But at the risk of sounding like an old man, this ritual – make no mistake, that’s what it was – invested the purchase with meaning and value for me, and I despair at a world that doesn’t at least offer the possibility of similar adventures to its inhabitants. This resounds simply with the fact that things that are worth doing are oftentimes difficult to do or to learn and things that are worth having are the ones you invested effort in getting. Just to narrow this down to music, 99% of the music I listen to has no meaning whatsoever to me. This has no bearing on the quality of contemporary music, which I think is actually quite high. Only a couple of albums and artists have managed to strike a chord with me that makes their music merit a repeat listen. This may be different for others but the real investment of Fl. 45,– or so back then was quite significant, distribution channels were few and the diversity they offered near zero, you got your recommendations either from mass media or from word of mouth. The experience was radically different. Yes, something has been lost in the transition but the abundance we have gained in return makes it more than worthwhile for me. Yes, I suppose you could always switch the thing off, leave it behind, deliberately “forget” it. But when you’ve lived your entire life through the intercession of a mobile and benevolent Delphi, is that realistically an option? I suppose we’ll find out. Having spent two and a half weeks in the United States most of which in and around San Francisco. I can testify that it is indeed not an option. San Francisco is so well mapped within most online services that the experience you have there using the internet is unparalleled. Most services originate there which results in San Francisco being completely mapped in Google Maps, well covered in Yelp and there are ample Twinkling Twitter users in the proximity. Unfortunately for a visiting European like myself it is prohibitively expensive to use roaming data, meaning that most of the time my iPhone was a multimedia brick. Being disconnected like this, made me acutely aware of how reliant I have become on the real and virtual compass my iPhone provides. Walking around without a continuous stream of data coming in on the iPhone felt as if a sense was missing. What is a sense other than a mapping of external information to a part of your brain? The services on my iPhone provide me with a sense of presence and sense of direction within my spheres of contacts. My brain is conditioned to receive regular updates to this sense and withholding those updates used to be called something like “withdrawal from information addiction” but since this is a sense we’re talking about, I think “sensory deprivation” may be better suited. Without this sixth sense so much of your peripheral ‘vision’ is cut off that you feel like you are wandering around half blind. Staying up all night to watch the elections we finally saw Barack Obama’s victory speech somewhere after 5AM. Though at that moment I couldn’t fully appreciate it, it was one of his best speeches and one ending a period. We’re only at the beginning and the things he does from now on are those that really matter. Everything until now a prelude of some sorts. It will be interesting to see how his transition goes and who he appoints to be in his staff and cabinet. In the meantime just to reminisce about how good a campaign he ran, what a phenomenal communicator he is and how he just comes across as a very sympathetic and funny guy, here a brilliant anecdote from the campaign trail. Watch it and then analyze its communicational layering; sheer and utter brilliance.